Namco has released its classic Ridge Racer on iPhone, although be warned that the game will only currently work with the latest iPhone 3GS. Namco has not optimised the lower spec 3G version for the moment, but promises us that it should be arriving soon. Ridge Racer Accelerated is now live on the App Store, priced at a mere £1.79. Drift across there to buy it, should you be packing a 3GS. The game evokes memories of the early PlayStation days, when Namco's arcade-style driving game really did bring (at the time) arcade-quality gaming into our lounges. 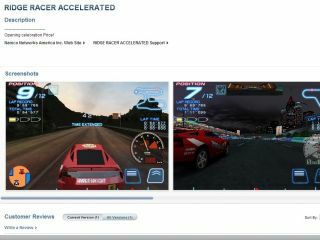 Ridge Racer Accelerated features a mere two tracks and two cars, with future downloadable content promised from the house of Namco. Right now, you can also buy a pack of nine additional cars for £1.19 and six extra tracks for £1.99, once you get bored of the first ones.